The Canon PowerShot SX40 HS Superzoom. One of the most radical innovations in bird photography in recent years has been the advent of the superzoom. Combining a high-powered zoom lens with a DSLR-style body in a single non-modular unit, superzoom cameras have brought telephoto photography to the masses. No longer is it necessary to invest big money in a long lens and separate body – for a comparatively low cost you can own a more compact set-up that will still bring you great results. Inevitably, there’s a catch, and that is an unavoidable compromise on quality. At the same time, however, the current generation of superzooms are much better endowed in this respect than their predecessors, something I discovered when putting Canon’s intriguing PowerShot SX40 HS to the test. This camera has the look of a compact DSLR with a small zoom lens, and handles like it too. The body is plastic but it feels well built, and this helps it weigh in at a very respectable 605 g (including battery and SDHC card). The real achievement, however, is in condensing a zoom lens with such a large telephoto reach into such a small form. From a 24 mm wide-angle to a powerful 840 mm telephoto, the 35x optical zoom range of this lens is staggering. Quality-wise it is also one of the best in class, and while it doesn’t pretend to be a match for Canon’s prime telephotos, it produces some very acceptable results. These are doubtless improved as a result of Canon’s built-in IS (image stabilisation) system, while zooming with this lens is also rapid and relatively silent (important when in movie mode). Initially I tested it in the office alongside two other superzooms, Nikon’s Coolpix P510 and Panasonic’s FZ150. All three returned decent results but the Canon came out best, appearing to resolve marginally more detail and produce less noise at ISO 800 than its rivals. In a range of field conditions it also performed impressively, and after using it for a couple of hours I found it to be a very competent and well-designed camera. Anyone who has used Canon cameras previously, whether DSLRs or compacts, will find that the controls and menus of the SX40 exude an air of familiarity. Scroll through the menus and explanatory prompts appear on screen to explain in a little more detail what each option does. This is a good place to begin with any new camera, setting up the shooting and camera settings so that it performs the way you want it to. Other settings are controlled via the wheel and function button on the back of the camera, while a control dial next to the on/off button on the top allows the user to switch between different shooting modes, including manual, aperture priority, shutter priority, program, auto and sports, as well as two custom buttons for storing preferred settings, then stitch assist, colour accent and, of course, movie mode. The SX40 HS has three movie options, including full 1080p HD. There are also choices for shooting stills, its 12.1 MP CMOS sensor producing images of up to 4,000x3,000 pixels. You can shoot in 16:9, 3:2, 4:3 or 1:1 formats, and in four different jpeg quality settings, but RAW is not available. Images displayed on the articulating 2.7-in screen on the back of the camera look crisp and colourful, and you can zoom in to inspect them using the same zoom control used during shooting (though you cannot zoom while recording in movie mode). After a week with this camera, I was impressed. It will have clear appeal to birders who don’t want to invest big money in a DSLR body with separate lenses, but who still want to be able to take great photos when the opportunity arises. It also has the significant advantage of small form and light weight, meaning it can be carried everywhere without ever being a strain on a day out. Importantly, for around £300 or perhaps even less, it is an absolute steal. 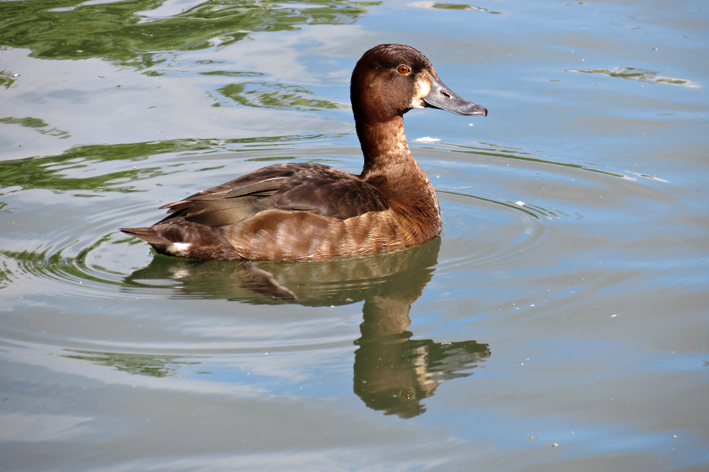 This Tufted Duck photo shows the quality of the images that can be taken with the camera. Click here for a selection of images taken with the camera.